When I started this blog a few months ago, my main focus was to shine a light on songs I felt did not get enough attention. These could be songs that were once popular and have since fell from the public consciousness, or were never commercially successful al all. With each song, my posts tend to gravitate between an analysis of the track itself to feelings from listening to it. Lately, it seems my selections have been lesser known tracks from relatively well-known artists. I don’t think I’ve spent much time discussing obscure artists that have had significant impacts on modern music. 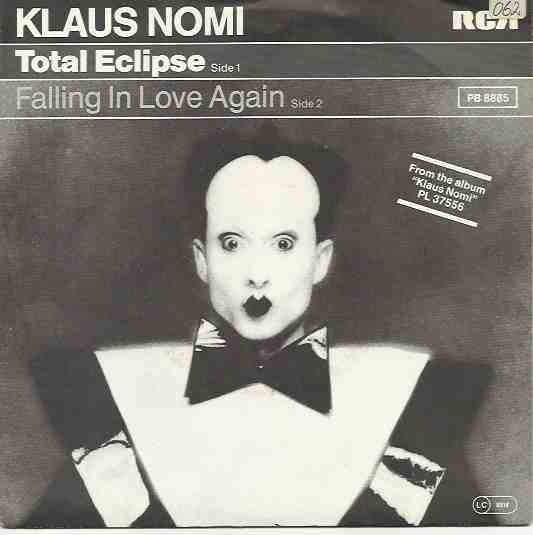 Klaus Nomi, a German born countertenor, was an early discover for me in college. I remember the first time I saw his likeness. He was parodied as one of David Bowie’s bodyguards in the [adult swim] cartoon show The Venture Brothers. I felt the show was extremely layered with offbeat references and I am the type of person who will investigate when I am unfamiliar with a reference. From there, I was an instant fan. The brief cameo in The Venture Brothers was a tongue-in-cheek reference to one of Bowie’s performances on Saturday Night Live. Bowie performed “The Man Who Sold the World” and “TVC 15” with Nomi serving as one of his backup singers. Standing behind this monolith of popular music was a strange-looking man with striking white makeup and pointy black hair. During that performance, Bowie was sporting an oversized, broad-shouldered vinyl tuxedo that would become part of Nomi’s iconic image. Unfortunately, that performance on Saturday Night Live would be Nomi’s only exposure to a widespread American audience. For me, Nomi’s signature track is “Total Eclipse.” After witnessing an electric performance on the 1981 post-punk concert film Urgh! A Music War, Nomi was a significant standout performance among an already impressive roster of performers including the Police, the Cramps, Gary Numan, and the Go-Gos. With what sounds like deep synthesized thunder, “Total Eclipse” immediately starts with a fiery intensity. The tracks features a deeply dark melodic synthesizer with a punky rhythm guitar that evokes an impending moody darkness. The pulsating rhythms and driving energy of the musical arrangement evokes a sense of danger as we feel the world turn cold as the sun is being eclipsed. Though the music is interesting and very danceable, it sounds generic and tame compared to the operatic bravado behind Nomi’s vocals. Nomi’s voice is an instrument in itself and immediately elevates any song from mediocrity to a stunning example of the breadth of post-punk and genre blending. Nomi expresses considerable range in the track. With each verse, his German heritage becomes quite obvious as he casually sings with pep. It sounds quite similar to the vocal phrasing on much of Kraftwerk’s discography. However, it is during the chorus that Nomi perfectly shows off his vocal talent. His voice projects several octaves higher as he belts out that it is a total eclipse that you can’t come to grips with. Even pushing his range further, he closes each chorus with oscillating pitch changes that prove the seemingly easy command he has over his voice. Blending his operatic training with the underground alternative music of the era, Nomi beautifully crafts his own niche in contemporary music. His is a style that is not easily imitated. Nomi’s career didn’t last long. Only releasing two albums during his lifetime, Nomi was one of the first musicians to die from complications related to AIDs. “Total Eclipse” from his first album was only released two years before his death. Since then, Nomi has become an icon for both his physical and musical styles. Popular musicians such as Morrissey have cited him as inspirations for their careers. Despite his popularity among post-punk fans and musicians, I feel Nomi will never get his due beyond being known as the odd-looking gentleman standing behind David Bowie. I feel a lot of musicians are afraid to take risks these days, so they don’t bring themselves to the sound. They let the sound define them. Klaus perfectly applied his own unique talents to his music and I respect him for that. He did exactly what he wanted before there was a total eclipse on his life. This entry was tagged david bowie, german, klaus nomi, post-punk, punk, saturday night live, total eclipse, urgh! a music war. Bookmark the permalink.